"If I had someone with pack horses, I would deer hunt...."
Finish this sentence in relation to California. My 73 year old Father is back to zero points in CA. His real joy in life is hunting from horseback and he can ride where angels fear to tread. So I am looking at where I can have him apply in CA where we can find some roadless areas in an alpine setting and we can cover some country on horseback. At 73 he can still run the A zone brush for half a day, but the altitude is a little tougher than it was 10 years ago. I''m considering some X units. the 6's, the 9's, And some zones in between. If you know of some country with trailheads we can get a pickup with 20 ft stock trailer into I'd like to talk with you via phone or PM. Once the snow melts off, I can take him summer scouting. Dad is a rifle hunter, but we have a .50 cal Hawken in the safe that hasn't killed anything yet. Edited by 2rocky, 15 November 2014 - 10:57 AM. What's awesome is the dog in that bottom pic! 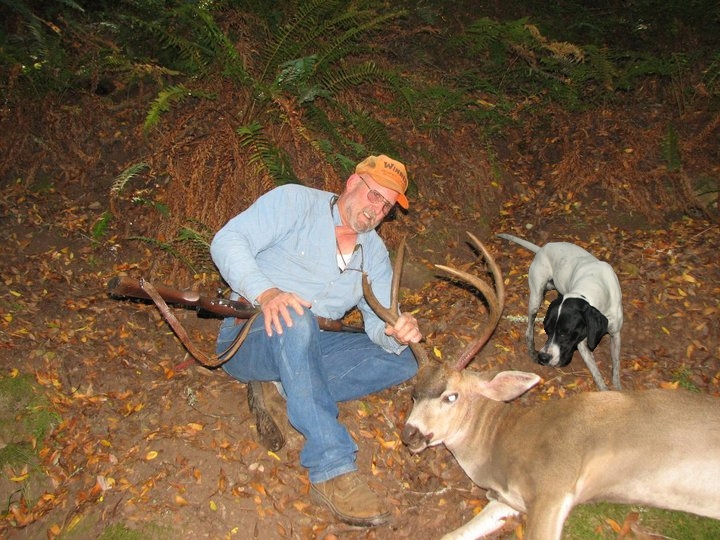 John, I'd hunt B Zone, rifle in a wilderness area. Tough in some of the x zones to get in real far as there's a pile of roads.....but that's from my limited knowledge and resources. Your dad is a stud!!! There are some good trails into the Kaiser Wilderness area in D7 that would be right up your alley. 10k and lower.Not too far in. Sweet pics. I'm no help as what I know would be D6 or X12. I just think it's cool Dad still likes to get after it. And tell us more about that dog. Wish I could help John. Is that a Pointer? I think I'd try d6 or d7. There's some nice high country down that way. The dog is Gator, and he is an English pointer. Big, rangy, great nose. He will hunt deer in a big circle, and may bark if he jumps one. No long trailing but he will get one moving. After 6 years or so he has figured out whether it is bird country or deer country, but sometimes a flock of quail might distract him for a little bit. an e collar when bird hunting is good insurance. My middle daughter likes hunting chukar with him. Beautiful dog. Good luck finding that special place to hunt. livin' the life!!! I pray to God i'm able to do that when i'm in my 70's! I just caught on to this thread. PM me if you interested in traveling to the eastern sierras with no points, but horses ready to go. That is killer. I'd be interested in a B zone hunt for sure if ya'll need someone else's crap to drag along! Depending on what else is planned this fall I have 5 points and wouldn't mind sharing them if the other plans fall through to use them. You couldn't pay me enough to go to the B zones....that area is thick with poison ivy...and me poison ivy don't mix! Good luck!